Grandma’s house in summertime was my favorite place to be as a child. The house is big two story farmhouse built by my great grandparents and set in the middle of the family farm. When not sleeping over at my cousins’ house, my sister and I would sleep upstairs in the room my mom grew up in. We would fall fast asleep covered in cozy quilts and wake up to the sounds of laughter from the kitchen. I would bound down the stairs and there would be my mom and aunt happily laughing in the eat-in kitchen. My grandma would be standing at the counter with the waffle maker working over time to keep up with all the hungry mouths to feed. Warm waffles smothered in butter and served with your choice of maple or corn syrup. I always picked corn syrup since it was different than what we would eat at home. Waffles were a weekly event at our house but grandma’s always seemed extra special. For our wedding, my husband and I received three different waffle makers as gifts. Waffles are serious business in my family. My favorite way to eat waffles is the classic butter and maple syrup but peanut butter and bananas are a close second. My kids sometimes like to eat them cut into sticks and dipped in syrup but most of the time they eat waffles with butter on top or plain. I love this recipe for its simplicity and light wheat taste. The waffles stay crisp even when cooled. Golden brown and buttery, this waffle barely needs a topping. This recipe is barely adapted from King Arthur Flour. You are welcome to half this recipe but since they freeze so beautifully, I recommend just making the whole thing. My waffle maker is from Williams Sonoma and uses about 1/2 cup batter. Melt butter in a microwave safe dish and set aside. Warm milk to lukewarm in a microwave safe dish (around 2 minutes), set aside. In a large bowl, whisk flour, baking powder, salt, and sugar. Pour melted butter into warmed milk and whisk in eggs. Pour milk mixture into flour mixture and combine using a whisk or spatula. Small lumps are ok, don’t over mix. Cook waffles according to your waffle maker’s instructions. Top with butter and maple syrup. 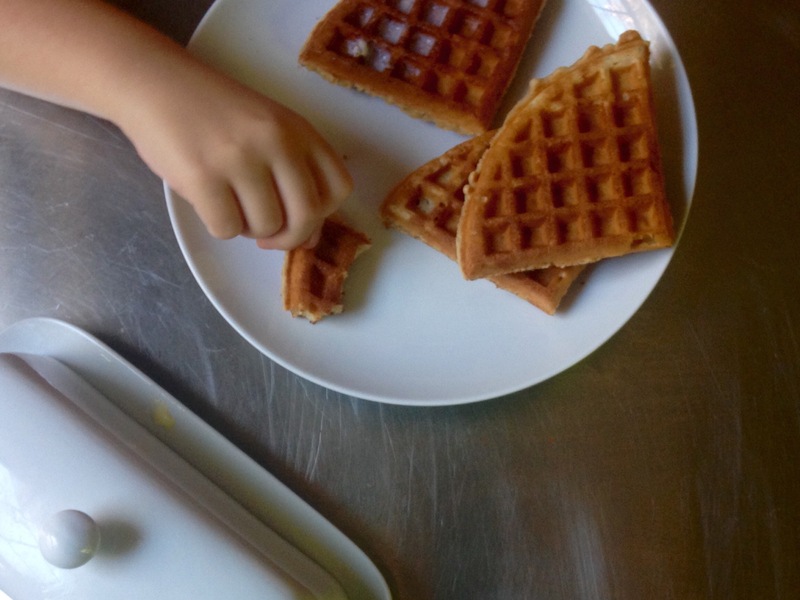 To freeze leftovers: place waffles on a baking sheet in a single layer and freeze. Transfer to freezer bags to store. Do you have Mom’s waffle recipe? I loved those times!!! They were for sure! No I don’t! Would love it if you have it. I want it too! Also…corn syrup, I forgot about that!